These homemade galette recipes are easy to make and taste fantastic. Galettes are rustic pies that have the crust fold up over the fruit filling. 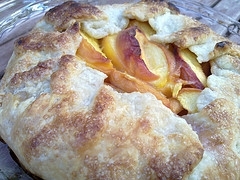 This rustic, gorgeous and tasty rustic pie recipe courtesy of Kelsey Nixon. Stir together the prepared fruit, 1/2 cup sugar, flour, and spices and/or seasonings in a large bowl until combined. On a well-floured surface, using a lightly floured rolling pin, roll out the dough into a large circle, about 12 to 14 inches. Make sure the rolled dough is chilled. Spoon the fruit mixture onto the center of the dough leaving a 1-inch border. Fold the edges of the dough over the fruit, pleating the dough, then dot the fruit filling with the butter pieces. Lightly brush the dough with egg wash and sprinkle with 2 teaspoons sugar. Bake the pie until the crust is golden brown and the filling is bubbling, 25 to 30 minutes. Cover the crust with foil if the crust browns too quickly. Cool. Serve the warm galette with ice cream. Add the ice water slowly while stirring with a fork, or in the food processor or mixer, until just combined. Be careful not to overwork the dough. Divide the dough into 2 disks, flatten and refrigerate each for at least 15 minutes. Almond Apricot: Season the sliced apricots with almond paste or extract. Spiced-Apple Pear: Season the sliced apples and pears with cinnamon, nutmeg, and brown sugar. All-Berry: Fill the baked crust with pastry cream and top with sweetened berries. Caramelized Onion and Walnut: Caramelize 4 Spanish onions; let cool. Top the dough with grated Gruyere cheese and spread the onions and toasted walnuts over the cheese. Spices and seasonings like citrus zest, citrus juice, pure extracts, cinnamon and nutmeg. I have more than homemade galette recipes, please check out my dessert list below.